Many fans of the comic asked us about the graphics, especially why we rely that much on 3D. This will be the topic of our first blog entry. First things first – we don’t really use 3D models in our adventure game. We’ve implemented our characters as render graphics, enhanced by a modified toon shader. Our first step developing the adventure was a big fat lot of research. We investigated for example, how Sandra, Woo and their friends behave and phrase. The already mentioned toon shader was part of this research too. We wanted the look of our models to be as close as possible to the webcomic. Many versions of the shader were tested, enhanced, deteriorated … or simply lost into the nirvana of not safed work. At the end we discussed things as banal as the hardness of the shadows or the thickness of the outlines for days and weeks. Particulary much work was spend for Sandra. One wouldn’t imagine the challange her ponytail was. 20-30 different types were designed but none of them could sustain our demand in all 8 angles of vision. We had no other choice but sending Sandra to the hairstylist for a new haircut, before every performance … diva! So Sandra as well as the other characters where rendered by 8 different cameras. This way we had enough material to let them move arround freely. Before an animation gets rendered, the actors need some make-up. Many details have to be modified for every perspective in order to make the characters look more comic-like. Larisa for example needs her pointy nose to show up, even if she looks into the camera directly. After the shooting the artist looks into the render directory full of hope. The next steps for him are getting disappointed, pulling an all-nighter, retouching myriads of unwanted trouser creases and tracing even more missing strands of hair, dammit! Sorry, last night was a long one … even minor roles take hundreds of pictures. While our 3D models are based on 2D sheets by Powree and other artists, within the scope of enviroment art, it’s exactly vice versa. Most of the HD background images where created in a 3D graphics software first. We tinkered little rooms, in which we placed little tables and cute little teapots. We also put little Sandras and Woos into the little rooms and let them chatter about the day by the tenor voice of a not so little bearded team member. The last part was not especially essential for the development, but it was especially fun. Aim of the exercise was placing all important objects, ways and such, sensible and well spread in the view. After we were confident with the result, it became the scaffolding of the 2D artwork – an artwork of layers and layers of foregrounds, backgrounds, middlegrounds and plenty of objects somewere between them. 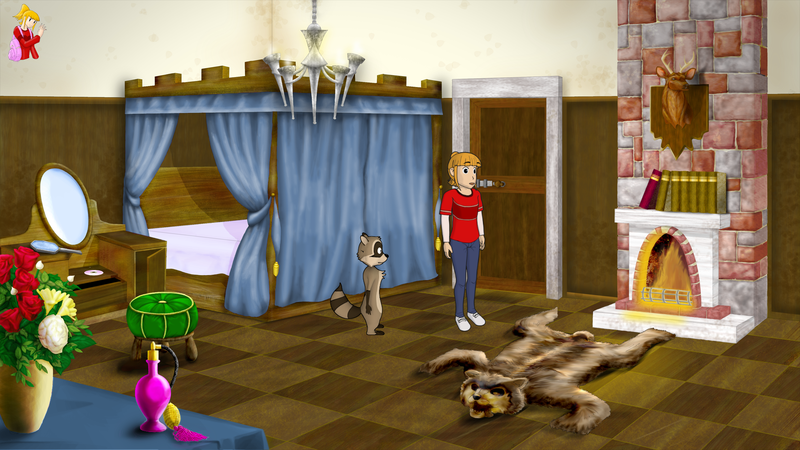 The look of Sandra and Woo in The Cursed Adventure was accomplished by merging different aspects of 2D and 3D graphics. In the next blog entry: Our experience with the Visionaire Studio game engine. Welcome to our development blog of Sandra and Woo in The Cursed Adventure! It’s been a long road. After the release of the Coldramar Chronicles (“Chroniken von Coldramar”) in 2011, a total conversion of Dragon Age: Origins, we started thinking about our first fully self-developed video game. Hopes were high and inspirations were many in those days. We spent a lot of time discussing what projects we’d like to do, and which ones we were able to. During this process – on the darkest day of the team’s history – we lost a team member and friend, our lead 3D artist, to cancer. When one door closes, another opens. The team founder and writer of the Sandra and Woo webcomic series came up with the idea of making a 2D adventure game within the Sandra and Woo universe. Finally this was a project we found ourselves capable of realizing. In February 2012 we started building a team for this – our most ambitious project ever. Looking back after more than three years, we underestimated how big, exhausting and challenging it would become.